Litchi doesnt support waypoints for the spar, only Autopilot does. I purchased your nld and got your activation code. I can't find anywhere on app to activate it. Please help. Looks like I needed to find and clean install of DJI Assistant 2 version 1.1.2. Then it worked. NLD won't work with the newer DJI Assistant 2. I'm still trying to find out what Max Attitude Tilt and Max Forward Speed values does. Changed Max Attitude Tilt from 35 to 40 degrees, no difference at all in GPS mode, still 20kph max speed. Also for me it's not logical at all that Max Attitude Tilt is the same for both GPS and Sport mode (35 degrees). Far as I know Spark will tilt much more in Sport mode to achieve higher speeds. Return To Home Speed value changed to 12m/s, so it' should go back to home point at 43kph instead of default 36kph. 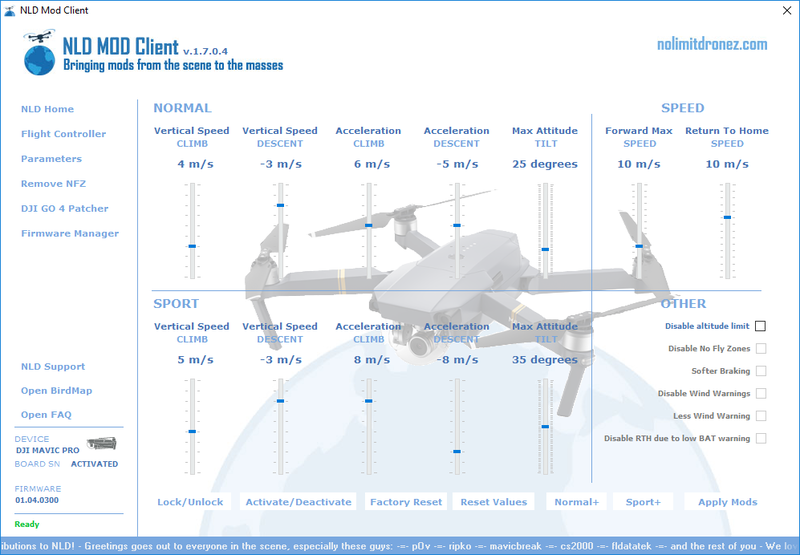 Actually I've never tried the values illustrated below, 10m/s (36kph) Climb/Descent seems VERY EXTREME, I have a fear that the drone will tumble on descent lol. Currently keeping on 5m/s for climb and 4m/s for descent in Sport mode. Holding mouse over light blue words like "climb", "decent" etc. will give you a description... of some sort. If you dare, try 55° tilt in Sport mode. Its extreme and your Spark will do close to 70 kmh... I do not recommend such values. I only want to raise the speed in GPS mode from 20 to 25ish kph. I thought that by raising the tilt from 35 to 40 degrees it would reach similar speeds but no luck. Speed remeained the same makes me think that either NLD mod app isn't applying the values properly, or 35 degrees tilt is related to something else. I would be careful with high speed and active gimbal. Its a delicate mechanism. NLD offer a GPS+ mode? You can search the web for optimal settings. No warranty given of course. I think GPS+ mode will change only vertical speeds and acceleration/deceleration values. I find their values for these plus modes VERY extreme so I didn't tested them in flight. Loving the mod, been on it for the past month. Top speed recorded is 50.35 MPH! What can I do to avoid the SPARK to (try to) return home when it thinks that the battery will be depleted? New NLD is out with some really new neat features. Anyone tested? I'm not sure I should simply because it uses DJI GO 4.1.22 now to patch it, and that means no OTG. The app is stable here, but it doesn't show the map at all (I have downloaded offline one). Also I can't review my Flight Records, the app crashes when I try to open any flight. Stupid question from a noob: I have created a patched version of the DJI Go 4 v4.1.22. Is this version correct for Android? I thought Android version used odd numbers and iOS even numbers? Finally got it to work. Make sure you remove the sd card from your drone. Once I did that had no problems flashing the AC.